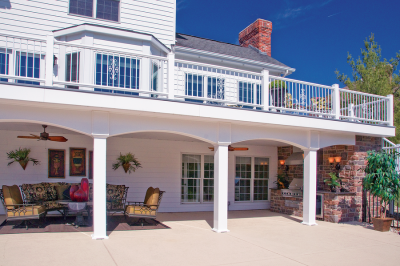 In September, Qualified Remodeler Magazine reached out to us for their feature about under-deck systems. 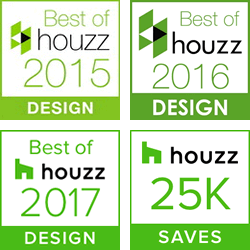 They only featured one other residential construction company in the article besides Heartlands. We appreciated the opportunity to contribute to this trusted resource for remodelers and home improvement professionals. To see the published article, click here. To see the full September 2017 issue of the Qualified Remodeler, click here. The associate editor of the magazine contacted our office and asked our owner, Larry, the following questions. Here is what Larry had to say about under-deck systems. QR: Can you start by talking a little bit about how you work with clients regarding their outdoor spaces? LB: When a customer contacts Heartlands, we first set up a free at-home consultation and meet with them about their vision and goals for their project. We also evaluate their setting and existing structure of the home and landscape. We take photos and initial measurements during the consultation as well. QR: Do they usually come knowing exactly what they want, or do you make recommendations upon seeing their home/outdoor space? Or is it a combination of things? LB: It really depends on each customer whether they begin the process knowing what they want. Most of the time it is a combination, and we refine in various features and finishing touches as we plan and design. Of course, the budget comes into play as the design process develops as well. QR: In what types of situations might you be creating a two-story deck with under-deck area? LB: When finishing the under-deck, we try to blend interior spaces, such as a finished basement, and/or adjacent outdoor areas such as swimming pools, patios, firepit, etc. The customer might also desire to simply enjoy the landscape. Finishing the lower level without trying to complement it with other features of the customer’s home is very rare. QR: How are you seeing such under-deck spaces being used (as gathering spots, for grilling, for storage only, or depends completely on the clients)? LB: We see under-deck spaces used for all the above (gathering spots, for grilling, for storage)—if for storage, then it is usually more modest of a finish. When a main outdoor space, these spaces may include fireplaces, spas, grilling and bar areas, etc. QR: Have you seen such spaces growing in popularity, decreasing, or no real change in demand? LB: We have not noticed a change. 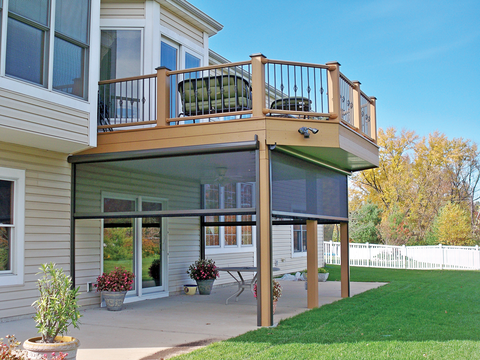 QR: What are the components needed for an under-deck system? Do those vary at all depending on the type of decking (composite, PVC, wood, etc.) used above? LB: Depending on design and materials, the parts we use for an under-deck system vary. QR: I see on your website that you list InsideOut and DuxxBak decking boards as a few under-deck systems you offer. How did you learn about those products, and what make them your preferred systems? LB: The InsideOut system works well for our customers. The DuxxBak is a decking board with a built-in drain system, which works well and allows for varying lower level ceiling finish to no finish at all. QR: What considerations are needed if/when installing lighting, fans, heaters, etc. for the under-deck area? LB: We finish our lower levels nicely and make sure they are inviting to gather and enjoy the great outdoors. To maximize the comfort of a lower level area, we take much consideration during the design process and listen to the customer’s desires early on in the process. QR: Any recommendations or additional considerations due to the seasonality of the area you are located/working in? Common elements to enjoy the space year-round include ceiling fans and heat sources. Other features like a TV, grilling area, refreshment area, etc. help the space become an area everyone can enjoy for years to come.